Back row: Hennepin County District Court Judge Pamela Alexander, Vice-President Scott Vreeland, Commissioner John Erwin, Commissioner Jon Olson, Commissioner Meg Forney, Commissioner Steffanie Musich and Commissioner Brad Bourn. Front row: Commissioner Annie Young, Minneapolis Mayor Betsy Hodges and President Liz Wielinski. 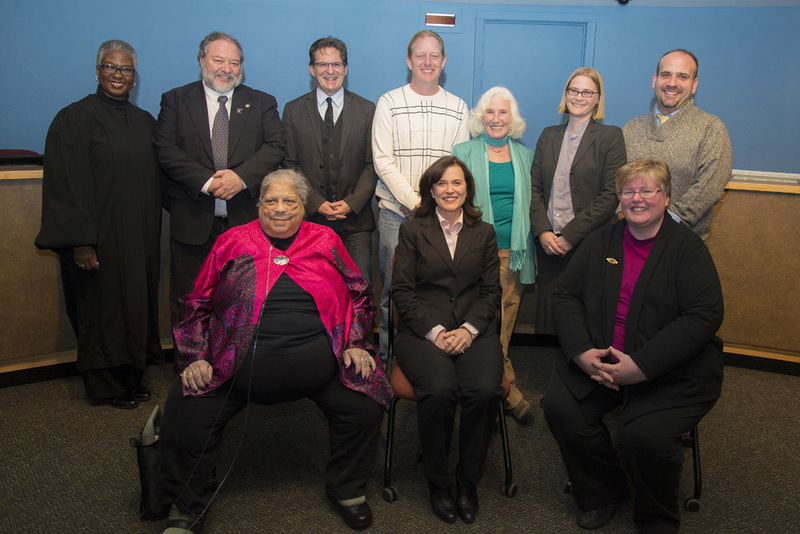 The Minneapolis Park and Recreation Board (MPRB) held its annual meeting Thursday, Jan. 2, and elected its officers for 2014. Commissioners elected Liz Wielinski as President and Scott Vreeland as Vice President. New incoming Commissioner At Large Meg Forney and 5th District Steffanie Musich along with the returning commissioners were sworn in to office by Hennepin County District Court Judge Pamela Alexander. The Board also elected interim Deputy Superintendent Pam French to serve as Secretary to the Board and Attorney Brian Rice and firm Rice, Michels, and Walther LLP as General Counsel. Notable elected officials in attendance at the Jan. 2 Board meeting were: Minneapolis Mayor Betsy Hodges, Minneapolis City Council Member Elizabeth Glidden and Minnesota State Senator Scott Dibble. Park Board Commissioners, ten citizens and Superintendent Jayne Miller were appointed to serve on the following external boards, commissions and panels. All terms are one year unless otherwise noted. The Minneapolis Park and Recreation Board typically meets at 5 p.m. every first and third Wednesday of each month for regular meetings. Board meetings are broadcast live from 5 to 9 p.m. on the Minneapolis Government Meeting Channel 79 on Comcast cable and online on the Channel 79 webpage. Meeting agendas and related information are typically posted on www.minneapolisparks.org two business days prior to each meeting. This entry was posted in Board Meetings on January 6, 2014 by citoyen1789.